Confession time… I’m waaaaaay behind in getting a blog done, and now I have a dilemma – there have been so many things happen that I’ve wanted to blog about, like the Humane Society of Washington County donation jar getting stolen from the table at Martinsburg Bike Night, and the subsequent exciting chase, capture of one suspect, and ultimate recovery of the jar with over $250 in it. (It was the father of the two juveniles who actually went out and found the jar!). 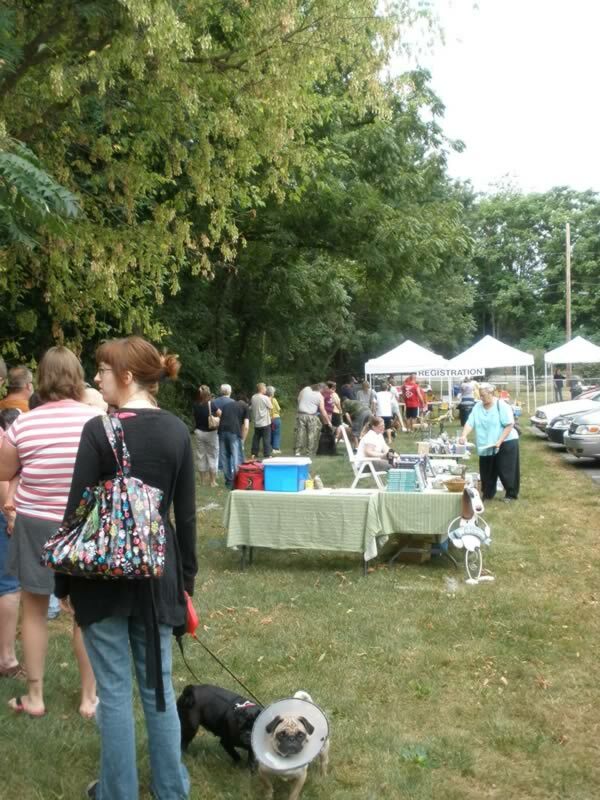 Or my observations from the Humane Society vaccination clinic and flea-less market that drew a long line of dogs and their owners for rabies shots. And then my good friend Don Hanson and his Greenacres Kennels in Bangor, Maine issued a Position Statement on “Dominance” and I realized I need to to do something similar… but that will have to wait a bit. But of course, the Behavior Modification Academy wins, hands down, for training and behavior appeal and photo opportunities. 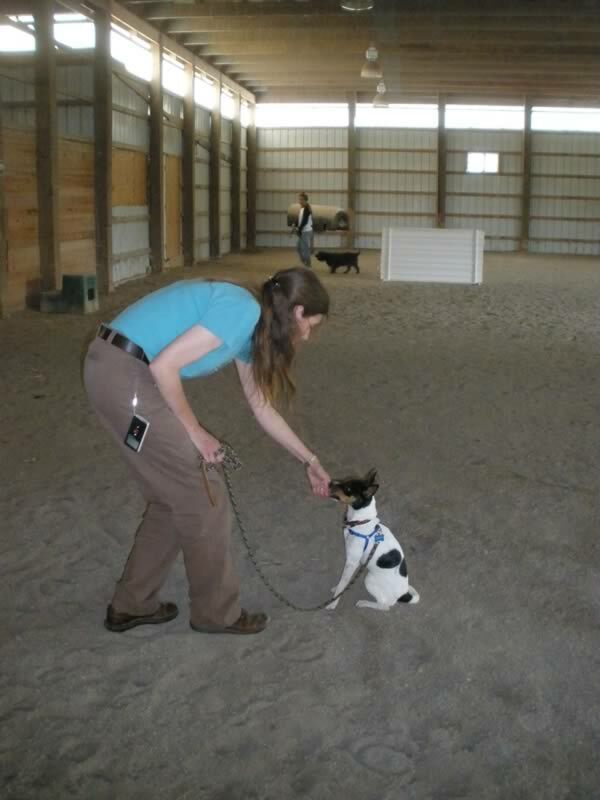 We offer several academies each year; usually three Level 1 Basic Training and Behavior, two or three Level 2 Behavior Modification, one Level 2 Instructor’s Course, and one Level 3 Advanced Behavior Study and Training (the first one of these is next month!). The groups are small – we accept a maximum of 8 in Level 1, 6 in Level 2, and 8 in Level 3. Occasionally we offer a Multi-Species Course. 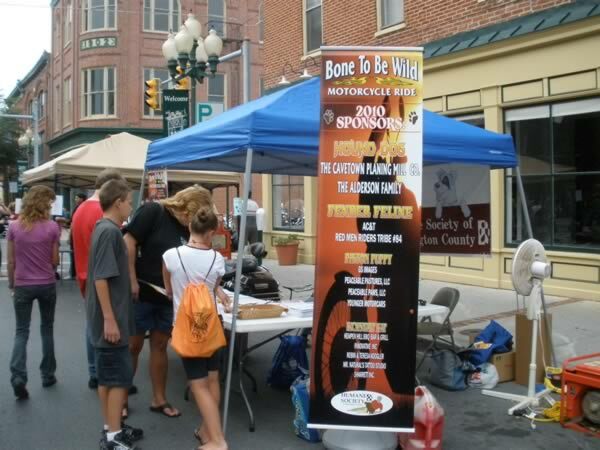 We had to cancel the Multi-Species this year and Sturgis the pig was most disappointed – he was hoping to be someone’s subject animal. BTW – we have one opening for this November’s Level 1 Academy, and the 2011 schedule is up, so if you’re planning ahead, take a look and get your registration and deposit in! Simone de Lima from Brazil, and Bonnie Miller. Simone and Bonnie. Love the T-shirt! 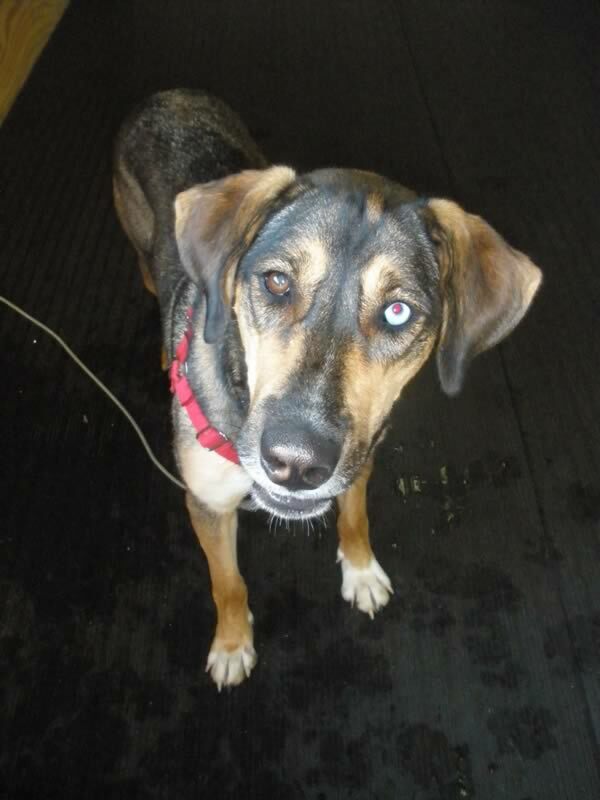 Jezebel is perhaps a Catahoula/Shepherd mix – very high energy, adolescent, surrendered by her owners to the shelter because they didn’t have enough time for her. She failed her assessment for resource guarding the week before the academy – she growled and snapped at the Assess-A-Hand – intense enough to make her ineligible for adoption. We were hoping to help her enough that she will be able to go up for adoption. 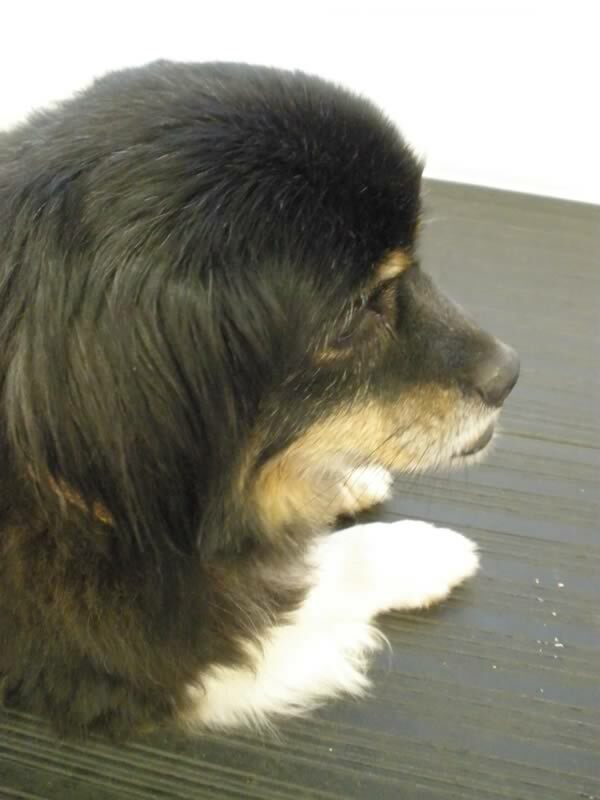 Some 7-8 years old, Dakota is a mature, sweet shelter dog (supposedly Pekingese/Shih-Tzu) who did some resource guarding during his assessment – not enough that he failed, but enough that the shelter thought it would be useful for us to work with him. 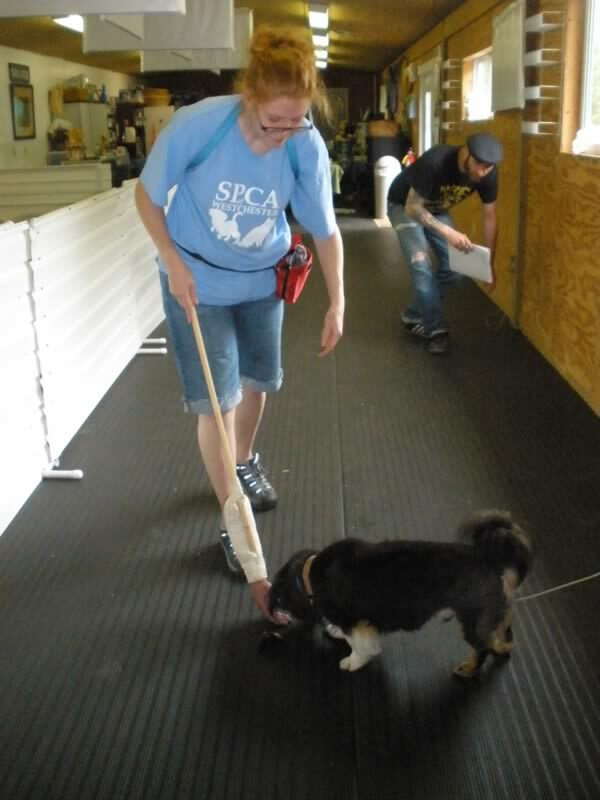 Dakota growled at the Assess-A-Hand during his shelter assessment but did not snap. 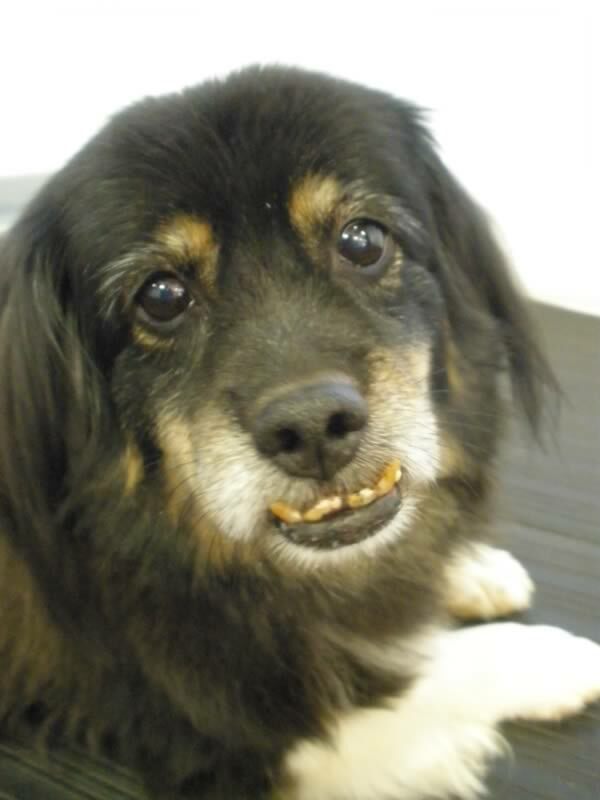 We all loved his underbite! They look like wax Halloween teeth! 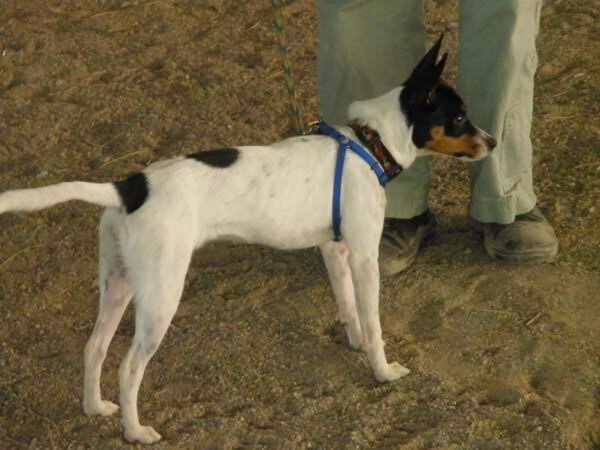 Pippy is a rescue Rat Terrier that Marci brought with her. She expected to work on mild resource guarding, but found that Pippy has a high level of reactivity to the environment and sudden environmental change, so she worked on that instead. 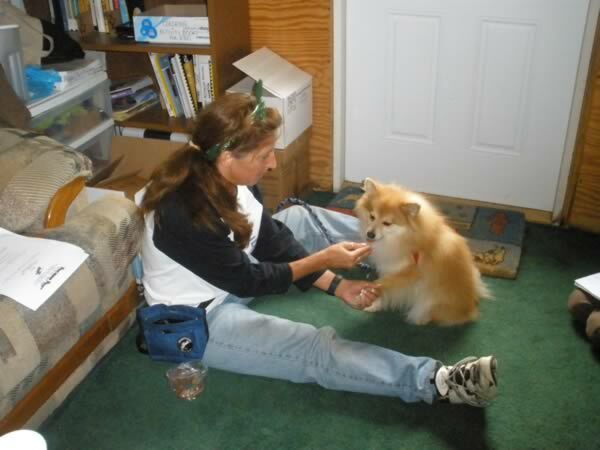 Cindy Mauro, CPDT-KA from New Jersey, and her Pomeranian, Wiley. Wiley in a contemplative moment. 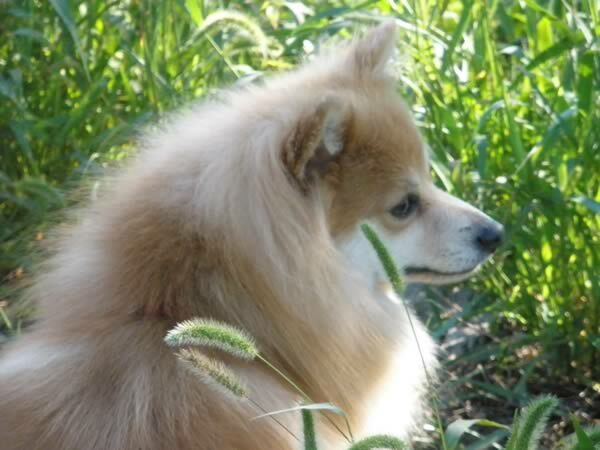 Did you know Pomeranians used to pull sleds and herd reindeer? Wiley was a foster dog, and a difficult one at that. He came from an abusive home, with a broken front leg that had to be plated. When Cindy got him, any restraint at all sent Wiley into a ferocious frenzy. She didn’t even like him much – at first – but then ended up adopting him, and now calls him her heart dog. She wants to be able to trim his nails and he’s still very sensitive to touch and restraint, so she worked on that all week. Students pair up each day with a different person so they have an observer and coach as they work with their dogs. By switching pairs each day they get to see the modification protocols as they are implemented for all the dogs throughout the week, so it broadens their experience here. 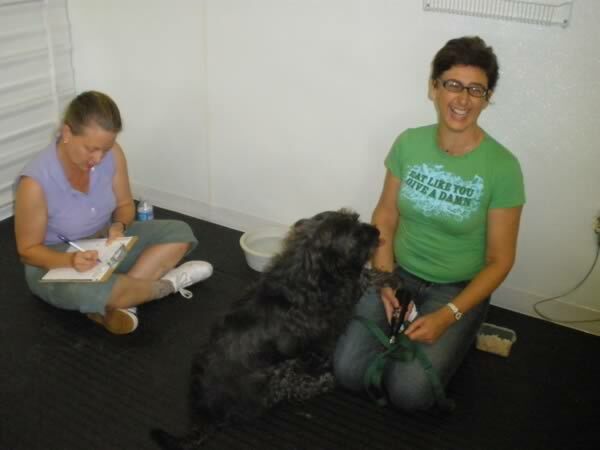 We also video the work sessions and review those during the discussion sessions, when the dogs are taking a break. Other discussion topics include the mechanics of doing behavior consults (my place or yours? ), discussion of cases presented by the students, a review of learning theory, and mock client consultations. By the end of the week, Wiley was enthusiastically offering his paw for holding and touching, tolerating pressure for several seconds, and accepting the presence of the clippers being opened and closed near his paw. 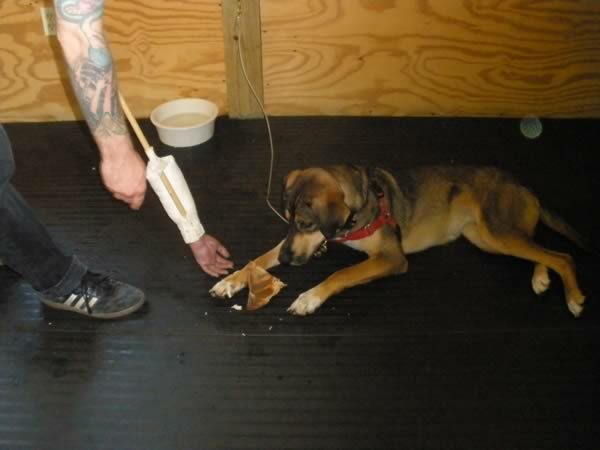 Cindy used counter conditioning and desensitization to accomplish this, first touching his leg and feeding chicken, and very gradually moving down his leg to his paw. She deliberately started with his left front paw, since his right front leg was the injured one, and he’s even more sensitive, understandably, about that one. Chicken? Did someone say chicken? We love clippers – clippers make chicken happen! 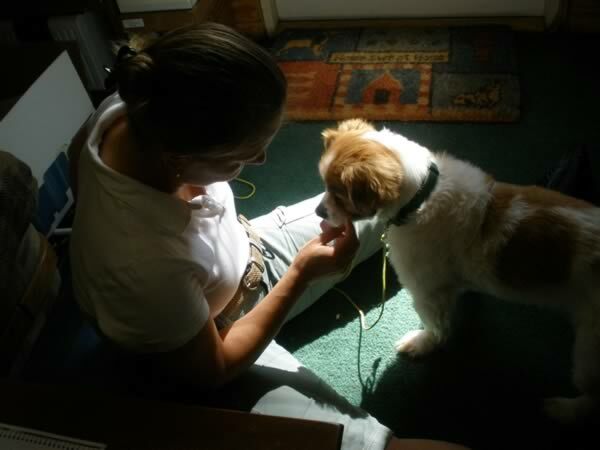 Marci worked hard on a Reactive Rover counter conditioning program with Pippy and had great success. From near-tears on Monday to a big grin on Saturday, Marci helped Pippy learn to cope with new stimuli and sudden environmental change. We found, happily, that while Pippy is quite aroused by new stimuli, she does habituate reasonably well, so by the end of the week she was handling the hotel well, and doing beautifully in her work sessions, with Marci carefully keeping her sub-threshold almost all the time. Bonnie in the background as neutral dog – Pippi loves chicken too! Petra and Dakota were starts with their efforts to counter condition the little dog’s moderate resource guarding. At first, Dakota was either too stressed or too distracted to even be interested in his cheese-stuffed cow hoof, and Petra was a little dubious that he even had a guarding problem. He did get more interested in his hoof as the week went on, and as Petra learned to stuff it with Vienna Sausage, chicken, meatballs, and freeze-dried liver. Over the week Petra did repeated pass-bys, then approaches, then actual interactions with Dakota’s guardable object, dropping chicken with each approach to convince him that someone approaching means good stuff! On graduation day, when Petra approached Dakota while he emptied his hoof he happily looked up at her and wagged his tail as she snatched the hoof away – and then dropped chicken for him. I could guard if I wanted to. Really. Simone was working with a Dremel grinder with Bonnie rather than a clipper. Bonnie’s dense black nails are hard to cut and you can’t see the quick (a big part of the reason for her discomfort with clipping) so I had switched to a Dremel some time ago. 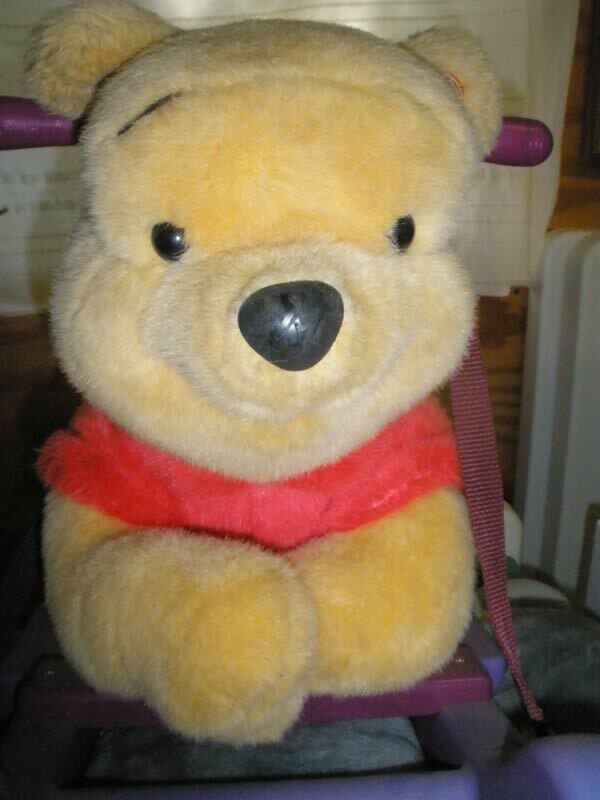 Simone’s program for Bonnie was similar to Cindy’s with Wiley – slow counter conditioning to the touch and handling necessary for trimming, and gradual introduction to the trimming tool. I promised Simone I would continue with her excellent work. The next time she visits us from Brazil, Bonnie’s nails will be happily short. Perhaps the biggest lesson our Intern trainers learned this week was the importance of going slowly. As my friend and fellow trainer, Jolanta Benal says, “If you think you’re going too slow, slow down.” And the paradox to that is that when you go slowly, you actually make progress much more quickly – because you’re not going over threshold and sensitizing rather than desensitizing the dog to the stimulus in question. As for me, as much as I know – as I grok that counter conditioning and desensitization (CC&D) are powerful behavior modification tools that simply work when done well, it still thrills me to the bone every time I see dogs and their humans happily CC&D-ing their way to behavior success. Great job, Interns – congratulations! 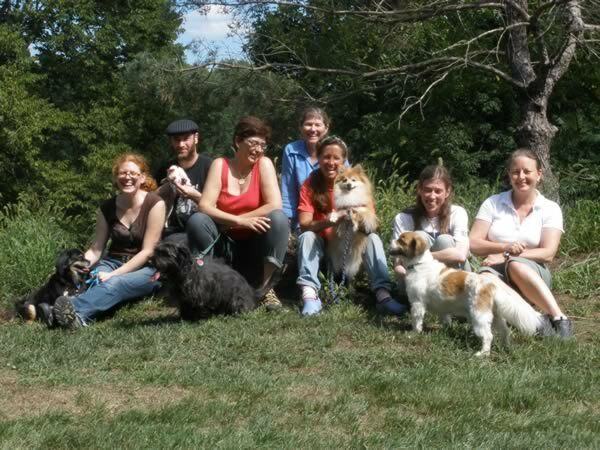 L. to R. – Petra and Dakota, Hugo and Petra’s Archie (Jezebel didn’t want to do a group shot), Simone and Bonnie, me, Cindy and Wylie, Marci wihtout Pippi, and our mystery guest. I broke down and just taught Juniper to file his own nails. Not that I’ve been having him do it regularly, la la la la la! *cough* See you next month! This is truley an experience I will always remember…what an excellent excellent learning experience. I will be back! and Wylie and I most certainly miss our hikes at the farm! You’re welcome to come back and hike anytime… it’s only 5 hours…!